Our 11am Contemporary Worship is held in our Worship Center, and features our band and praise team leading in contemporary worship songs in the style of Chris Tomlin, Hillsong, Crowder and Matt Maher. Pastor Dave shares a relevant message and the entire experience lasts one hour. 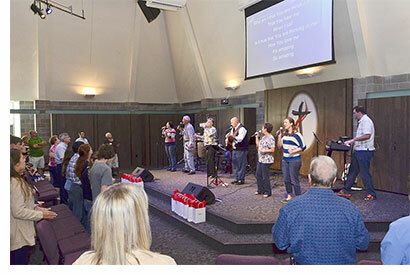 Praise Band – Our Praise Band is the engine that drives our contemporary worship experience. We are always open to new musicians being a part of our team. If you play an instrument and want a chance to use your gifts, contact Dave at worship@asburycolumbus.org or text him at 812-603-4885. Praise Team – The Praise Team members are our vocalists that help lead the congregation. If you are interested in joining this team, contact Dave at worship@asburycolumbus.org or text him at 812-603-4885. Tech Team – Our contemporary worship experience depends on several tech team members each week. Sound techs, lighting techs and projection techs are a vital part of our worship team. If you have an interest in any of these areas, contact Dave at worship@asburycolumbus.org or text him at 812-603-4885.